Alternative Title(s) Aoki Densetsu Shoot! Aoki Densetsu Shoot! (Legendary Blue Shot!) or also known as just 'Shoot! ', is the story of Toshihiko Tanaka, Kenji Shiraishi, and Kazuhiro Hiramatsu. Three high school freshmen who have become best friends during their junior high years while playing soccer together. 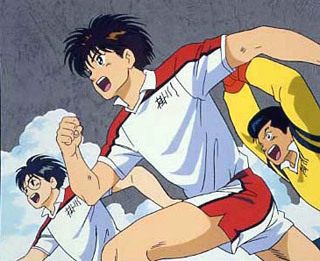 There they were known as the Kakenishi golden trio for their role in making Kakenishi Junior High's soccer team into a force to be reckoned with. After junior high, all of them decided to go to the same high school, Kakegawa High, a school only founded a year before, because of their star soccer player, Yoshiharu Kubo, whom they had idolized. This young man led Kakegawa High Soccer Club to the best 8 of their prefecture in their first ever appearance with a freshmen only team almost single-handedly. He refuses offers from a number of foreign professional soccer clubs so he can stay at Kake-High to lead them to the All-Japan High School Championship. As the three of them start playing soccer for Kake-High, they experience hardships, romance, and losses on their road to becoming the best Japanese high school soccer team - a team of legends. Aoki Densetsu Shoot! is based on the award winning manga Shoot! (1994 Kodansha best manga of the year award). The anime was based on the first series of what became a total of 4 series of Shoot! manga that covered a total of 66 volumes. Shoot! 1: 33 volumes, Shoot! 2: 5 volumes, Shoot! 3: 12 volumes, and finally Shoot! 4: 16 volumes, with the last series ending only in 2003. A live action movie was also produced in 1994 starring the famous j-pop band Smap.